Home » »Unlabelled » If You Ever Develop A Black Mark On Your Fingernail Like THIS, Rush To The Hospital. Here’s Why.. 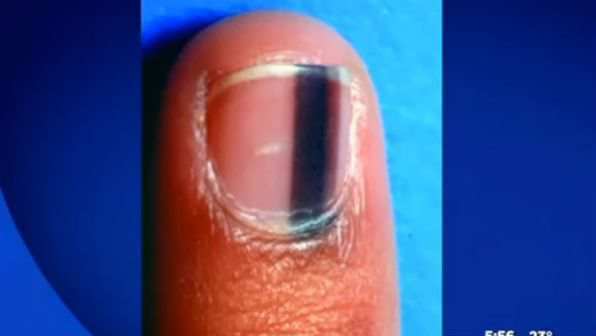 If You Ever Develop A Black Mark On Your Fingernail Like THIS, Rush To The Hospital. Here’s Why..
After a woman had her world rocked with a cancer diagnosis, she has turned to social media to spread awareness and encourage others to get any suspicious growths and marks on their bodies checked out as soon as possible. Just weeks before her cancer diagnosis, Melanie Williams, 36, first noticed a strange dark spot appearing under her thumbnail. She thought it was only a fungal infection or a wart. But she was about to have her entire world rocked. The truth was much worse. “Sadly not,” Williams posted on Facebook when she learned it wasn’t a wart but cancer. The mother of three was diagnosed with melanoma, a form of skin cancer that surgery could remove. Williams made it clear that her skin cancer appeared quickly in just a matter of weeks. Williams seems to have accomplished her mission. Since she shared her photo on July 8, her post has been shared on Facebook 120,000 times. What do you think about this form of cancer?